A method for the determination of penicillin V together with its impurities and by-products formed during biosynthesis, using capillary electrophoresis (CE) with UV and electrospray-mass spectrometric (ESI-MS) detection is presented. Aqueous and nonaqueous electrolytes containing 20 mM ammonium acetate were investigated to determine their suitability for the separation of these analytes. These carrier electrolytes were optimized with respect to the pH and the solvent/s used (water, methanol, acetonitrile, ethanol and isopropanol) and it was shown that although the nonaqueous electrolytes offered unique separation selectivities, the best results in terms of selectivity and sensitivity were obtained for the aqueous system. 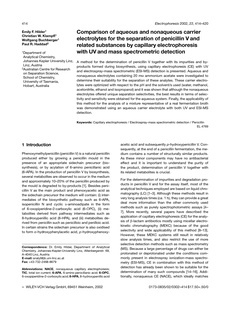 Finally, the applicability of this method for the analysis of a mixture representative of a real fermentation broth was demonstrated using an aqueous carrier electrolyte with both UV and ESI-MS detection.